Alex Toth is one of the most influential, prolific, and under-acknowledged artists in history. Alex Thoth died, as he lived, at his drawing table. Most comics artists are remembered for their masterwork. Kirby has the New Gods, Thor, the Fantastic Four, and Cap. Ditko and the Romitas have Spiderman. Eisner has the Spirit and A Contract with God. Toth never stayed on one project long enough to really own it. He just did a better job than everyone else. Jordi Bernet is famous for Torpedo, but Toth took him to school when he drew the book. Same goes for Neil Adams' Batman, the Black Canary, or any book Toth ever touched. His work was just graphically and narratively more advanced than anyone else of his time. It was superficially simple but elegantly complex in its effect. It was, and still IS, ladies and gentlemen, some next-level-hocus-pocus. In spite of this, Toth is often forgotten because he is a master without an obvious masterwork. One exception might be the Zorro comics he drew for Disney, but those are so tragically over-written that much Toth's genius is hidden by cumbersome speech bubbles and unnecessary narration. Another might be Toth's more 'branded' creations for animation: The Superfriends, Jonny Quest, Space Ghost, etc. The dude single-handedly designed and boarded Hannah-Barbara's entire action lineup. Entire networks have been built on rebroadcasting, dubbing and otherwise recycling Toth's Saturday-morning ouvre in much the same way that whole careers have been founded on imitating his style. Dude was not only excellent, but PROLIFIC. Somehow, despite all of those memorable, pervasive, still-relevant creations, he is largely anonymous. And I wouldn't really care, except that Alex Toth DESERVES to be remembered. Because he cared. He really did give his life to the craft, to making great pictures and telling thrilling stories with real flair, and we should remember him for giving us what he did. Because without Toth, there is no Superfreinds, no Jonny Quest, no Birdman, no Herculoids. No Bruce Timm, no Mazzucchelli, no Mignola, no Azaceta. No Venture Brothers, no Space Ghost Coast to Coast, no SeaLab, no Adult Swim. And I don't know about you, but without those things, I just wouldn't be me anymore. So remember Alex Toth. 'Cause he helped make us what we are. Also, whoever can name the characters drawn above from memory gets the sketch. space ghost's friends Jayce Jan & Blip. Yeah I watched them all the time growing up (shows my age). Sorry to comment again, but did Toth do the Herculoids design too? That was actually my favorite, I'd get thru Space Ghost just to watch that Herculoids', that intro where the moon breaks a part, and other cool tricks like Tundro's ability to shoot rocks out of his horn - this of course led to a still-present obsession with anything Frank Frazetta. Jacye, Jan and Monkey Sidekick Face! 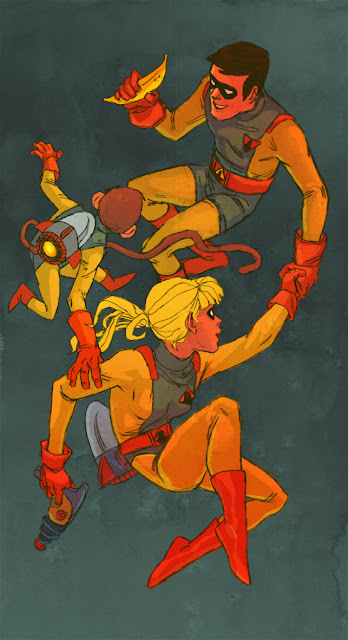 Gotta love Jace, Jan , & Blip from Space Ghost. Although I may be a little late on the draw, I still love your post dude. Great write-up. I admit to dismissing Toth way too much, but you make a strong case for his relevance and impact on today's art. Makes me wish I knew the characters above... and not just to win a sketch. Brother Toth will always live on in our hearts. Ohmigosh, Blip has man hands. do WE have Blip hands? Logged in to get the sketch. Too late!! !